John Burns served aboard the USS Medrick as the ship's yeoman. Christmas time on the USS Medrick. Included in the photo are Eddie Fernandez, William Carhuff, and John Burns – sporting the beard. Robert Haga served on board the minesweeper the USS Chickadee. He swept the coast of Normandy on D-Day. John Burns and Robert Haga each served on different ships. They met at the Warhawk Air Museum. Every first Tuesday of the month, the museum hosts a get together, known as the Kilroy Coffee Klatsch, to meet and swap war stories. Burns was wearing a hat with the name of his minesweeper, the USS Medrick. Haga wore a similar hat, from the minesweeper the USS Chickadee. Burns says they were immediately bonded as soon as they saw each other’s hats. Haga’s ship went to Normandy June 5, 1944, the day before the Allied Invasion. Their job was to clear out mines before D-Day to allow troop ships to land in France. World War II veterans John Burns and Robert Haga talk about their time aboard minesweepers during the war. 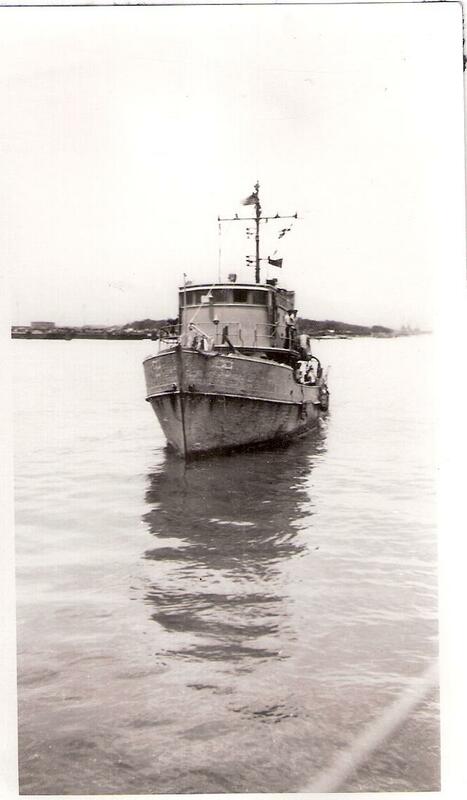 The USS Medrick, was a small craft. It was made entirely of wood so the magnetic mines wouldn’t be attracted to it. Burns’ minesweeper, the USS Medrick, was a small craft. There was a crew of 33 with three officers. It was made of wood from top to bottom so the magnetic mines wouldn’t be attracted to it. The Medrick went in first, into unknown waters, to find the mines before the other ships came in. “It was dangerous,” explained Burns. “We knew where the charts were on the mines, but there were some that came loose. They were floating, but some did not float to the top. They were under the water but they were caught on something. "So we’d have to send a diver down and the diver would put on this heavy old fashioned diving gear. We’d lower him over the side and he’d go down and check the chain on the mine and if it was caught, he’d loosen the chain so the mine would float on top of the water." "One night I was on duty, I was at the helm,” said Burns. “It was the 12 to 4 am watch, I think, or maybe the 4 to 8 am watch and I was supposed to be relieved by a buddy who lived in Idaho. So he’s coming to relieve me. He opened the hatch and walked in and we had a counter and he just went over to the counter and laid down. He was so sleepy but he didn't dog [close] the hatch. Burns was clearing the bay of mines in Kobe, Japan when he found a female puppy, only a few weeks old. 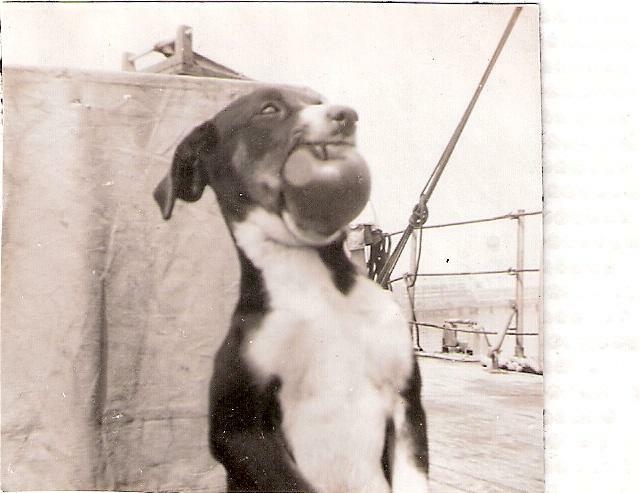 Young “Kobe” became the “apple eating mascot” of the USS Medrick. John Burns and Robert Haga were recorded at the mobile StoryCorps booth in Boise. StoryCorps is a national initiative to record and collect stories of everyday people. Excerpts were selected and produced by Boise State Public Radio.